I think InputBox() function is one of the few things that we come across when start learning VBA and discard it later altogether when we see more exiting objects like MsgBox(). Probably its usage is not properly understood and it doesn't deserve this neglect. The usage of Inputbox() function is very simple like MsgBox() but seldom used in programs to gather user responses. Instead, MsgBox() is the most preferred control, which has a variety of options available to configure it with different options of Command Buttons. But these options are like OK, Cancel, Retry, Yes, No etc. MsgBox cannot be programmed to make selections from user defined Options like the facility provides by InputBox(). We have learned how to use Office Assistant with preferred default Animation character instead of MsgBox. We have also seen how to collect user responses using Office Assistant with Check-Boxes or Option Balloon Menus in them. But, I admit that the VBA routines involved in these methods are complex and needs some time to understand the intricacies. But, once the program is in place the usage is very simple and can be inserted freely in your Code across projects, when placed in a library database and when linked to your other projects. Coming back to the Inputbox() function; let us look into a simple example in a sub-routine. A Report Command Button on the Main Switchboard when clicked; a small menu is displayed asking the User whether she would like to get (1) Report Preview or (2) Print the Report directly to the Printer or (3) Exit, if there is a change of mind. The Title and Default Values parameters are Optional. There are other optional values as well. You may check for them in the Microsoft Access Help Documents. 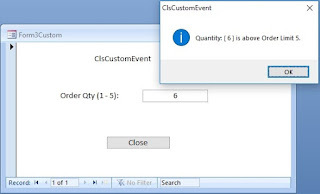 The Code that brings this Form up on a Command Button Click EventProcedure is given below. When the User makes a selection as per the Options provided, the selected value is tested and executes the actions programmed in the Select Case. . .End Select statements. While using Inputbox() this way in programs we must take care of few things to avoid some undesirable side effects and pay attention to give the Menu a better look as well. First, we will take the side effects part. We have provided Option 3 to close the Dialog Box normally, if the User has a change of mind after bringing up the Menu. But, she may ignore option 3 in the Menu and may use the Window Close control on the Title bar or click on the Cancel Command Button instead; that can invite trouble in the Code. Since we have defined the Option Values in the Menu as Integer (1,2 and 3) naturally we will think about using an Integer Type Variable to record the response of the User. But, the User may click on the Cancel Command Button or Window Close Title Bar control, without selecting any of the options displayed, to close the Window. In that case the InputBox() Function will return an Empty String ("") as response. If we have defined an Integer Variable to accept the returned value, then this will end up with a Type Mismatch Error and the program will crash. We can use a string variable to accept the Empty string result to avoid this problem and the Select Case. . . statement will work without modification even though we are testing for Integer values rather than in Case "1" style. A reasonable Variable Type selection to record the user response in these circumstances is a Variant Type that can accept any data type. With a little trick we can make the program to ignore the Cancel Button and Window Close Title Bar control Clicks and force the user to make a selection from the Menu Options only, if she want to get out of the Menu normally. We have inserted 1 as third Optional Parameter Value to take care of the OK Command Button Click by the User just in case she doesn't type a selection value from the Menu Options and simply hits the OK Button. If she types one of the Option values in the Text Box and hits the Enter key, as we expect her to do, that will return the value selected into the varResponse Variable and the InputBox control will close normally. to ignore the Cancel Command Button and Window Close Title Bar control clicks. strMenu = strMenu & "3. Exit"
We will put the InputBox() Function within a Do While . . . Loop with a condition so that the Function will keep repeatedly executing if the user doesn't make a valid selection from the Menu and discourage her from Clicking Window Close or Cancel Buttons to get out of the Dialog Box. strMenu = "1. Report Preview" & vbCr & vbCrstrMenu = strMenu & "2. Print Report" & vbCr & vbCrstrMenu = strMenu & "3. Exit"
strMenu = strMenu & "E. Exit"
Really nice laid out site with great code examples. Marking this as a favorite! !